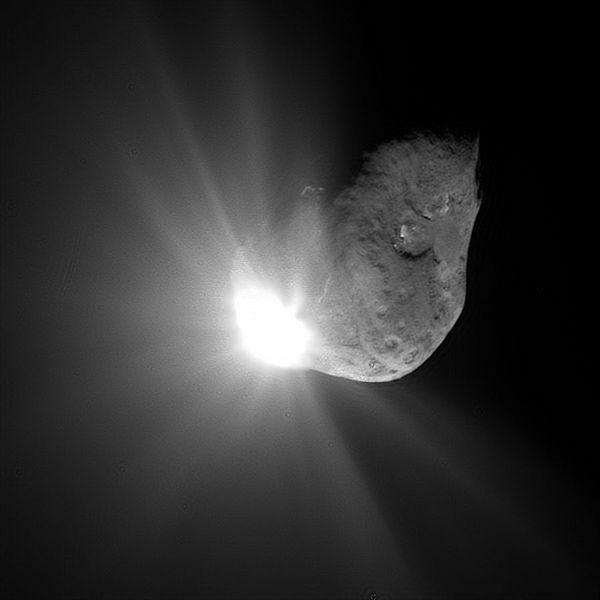 Get ready for some more close up pictures of comet Tempel-1 as NASA's Stardust probe passes by it today. The Deep Impact mission, arguably NASA's most dickish mission to date (imagine splashing someone with a puddle using your car in order to observe the result), flew by there in 2005 as it dropped an impactor onto the comet and observed the results. Stardust just happened to be on a trajectory that made a flyby possible this year (imagine you have a friend driving around the neighborhood with a camera that will then make a slight detour to take pictures of the drenched pedestrian as he or she walks home -- in the name of science), and thus we now are going to be able to see the comet a few years after impact, a rare opportunity indeed. This will be the first time we've been able to see a body this size twice from close up, and what has happened to it during the past 5+ years will tell us a great deal more about comets and their makeup...and the more we know about comets (and the more of them we discover), the easier it becomes to predict what is lying out in the farthest reaches of the Solar System, possibly even a Jupiter-sized planet or larger.